the ring at a 45 degree angle. Super stylish and unlike any other tungsten ring, this 8mm Oris style ring is sure to turn heads! This ring also comes in a 5mm. Was this answer helpful? 15 of 17 Customer(s) found this Answer helpful. Q: Do your rings come apart so they can be safely removed in a medical emergency? Usually Tungsten rings cannot be cut if needed so the finger has to go instead. Ouch!!! A: Hi Ted, yes they can be removed in a medical emergency. Tungsten rings are not indestructible and hospitals can snap them off. No need to worry! If there is anything else you need, please let us know! Thank you so much - TF! The ring is gorgeous! I received it very quickly in the mail. I am very pleased with the high quality of the ring. We bought this ring as a 2nd replacement after my husband lost his original ring last year. The first replacement ring cost 5x as much and wasn't anywhere as near good quality as this ring. He plans to wear this ring full time as it looks great and is comfortable. Happy with purchase and great value for the price. Absolutely fantastic. The ring is more than I expected for the price. It Is durable and maintains its brilliance. I originally ordered a size to small but it was replaced immediately by the correct size at no charge. I am one happy customer. Purchased as a gift for my husband. He loves it. Has already received several compliments. great quality, liked the design, nice weight to ring and fits great. I also like the fast shipping. I will order again. Great ring lost my gold weding ring need a replacement. Wife and I are very pleased with the look. 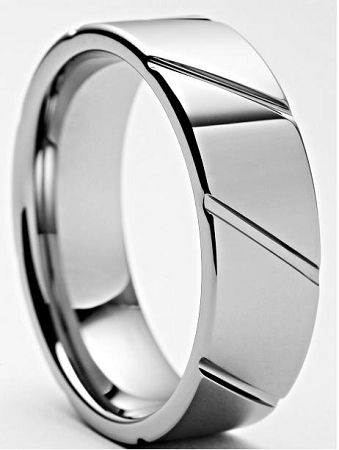 With this ring design it would be nice if mfgr could connect the grooves creating another style of ring. Yes, I was very happy with this ring. Exactly what the picture shows. I'm completely satisfied with my purchase of this ring. He loves it! Great service lovely ring fits perfect good price. I too lost my gold/diamond wedding ring..
Love the unique style - Thank You! I have purchased many Tungston rings, the quality and unsurpassed durability make it the perfect choice and Tungston fashion has the best prices I have found anywhere. Unlike any stainless rings these can be worn anywhere in all conditions without fear, my most recent purchase the ORIS is a comfortable ring with smooth rounded inside for a great feel and the precision in the manufacturing is always just as represented. I initially purchased the classic domed, 1 it was a tad too big and 2 the metal color was a little darker than expected. Exchanged it for the Oris, the 8mm looks much better than the 6mm I originally had and the design looks great! Wearing it as I'm typing this...I give it 4 stars for the ring, just because I wish the metal was a bit lighter in color and 5 stars for the great customer service! Will buy again...thinking about buy the wife a matching one or the Odyssey she liked. Very pleased with everything. Beautiful ring, quick delivery, will shop here again. Thank you.